Fall sale season is now in full swing, and Georgia cattlemen have numerous options to choose from in the current bull market. So, it seems logical to devote this article to a review of some of the basic principles of bull shopping. If you have been in the cattle business for very long, you are intimately familiar with the many purchasing decisions that your operation requires you to make. From feed and minerals to medications, equipment, and pasture management, it seems that the task of finding the best option for your farm is never-ending. While operational decisions are undoubtedly important, there is one purchase that is a tangible investment in the future of your program. If you choose natural service as your primary breeding system and maintain a closed herd, the only source of new genetics you bring into your program will be from the bulls you select. Research has shown that following three generations of retained replacement females, 87.5% of the genetic make-up of the heifers you retain is the result of your last three bull purchases. This makes your herd sire purchasing decisions critical, to your operation’s success. When you consider purchasing a herd sire, there are a set of minimum standards that each bull should meet for consideration, and then there are “extras” that a seedstock producer may choose to provide which will add value to a bull. It really is impossible to buy a bull that is “too good”; however, it is entirely possible to buy a bull that is “too expensive,” so let’s take a look at some factors to consider when you are standing in the sale pens deciding what to buy. Earlier in the is piece, I mentioned certain minimums that a should be considered when purchasing a bull. By this, I mean if the following information is not available to you, consider it a deal-breaker, shake hands and walk away! If you read many of these articles you know that the sale of one calf per cow per year is the only real source of revenue for cow calf producers. While it is true that some income can be generated by the sale of cull cows and bulls, sale of these animals costs the operation in terms of capital, and will not translate into profit over time. It’s unfair to say that every cow that doesn’t get bred is the bull’s fault. Cow fertility is a complex matter independent of the bull, but it is certain that bulls who are unable or unwilling to breed cows will result in a loss of revenue. Bull fertility is a function of several factors including but not limited to age, genetics, nutrition and health; however, the only objective method for evaluating bull fertility is a breeding soundness examination(BSE). For this reason, it is critical that any bull you purchase should have passed a BSE in the past 30-60 days. A BSE should be performed by a licensed veterinarian or trained professional and should comprise an assessment of scrotal circumference, sperm concentration, motility and morphology, the bull’s physical ability to breed based on structure and general health, and physical examination of the reproductive organs (Table 1). A “satisfactory” bull is determined to be acceptable for all criteria. It is important to note that this is not a guarantee of fertility, but that nothing was found that would affect potential fertility. Bulls, particularly yearlings, must be observed to ensure that acceptable libido or sexual desire persist through the breeding season after purchase. Do not buy bulls, or any breeding cattle for that matter, if health and vaccination status has not been verified. Bulls from reputable programs will be vaccinated and a simple look at the sale catalog or conversation with the seller should provide all the information you need for your records. In addition to confirming that vaccinations have been given, inquire as whether any boosters have been given and the date of the last vaccination. Any animal that you bring onto your farm should go through a quarantine period, but it is important to know when vaccines were given because it takes time (30-45 days is best) for immunity to build after a vaccination is administered. Stress caused by sale day, hauling, commingling with other bulls, or turnout on cows can slow this process down. It is vital that your new bull have peak immunity in the first 30 days after turnout so that fertility issues associated with disease or vaccine stress are minimized. Apart from vaccines, bulls should be bright eyed and active with no signs of respiratory or digestive distress. They should have tested negative for PI-BVD and results available for your inspection. Feet and legs should be examined for soundness, and body condition score should be no lower than a 5 on a 1 to 9 scale. A desirable BCS of 6 is pictured in Figure 1. Note that the ribs of the animal are not visible and that there is noticeable fat covering in the forerib and small pones around the tail head. There should be noticeable flesh in the bull’s flank and moderate width and substance to the brisket area. In the case of aged or nonvirgin bulls, negative test results for trichomoniasis, tuberculosis and PI-BVD are also recommended in addition to the records previously discussed. The amount of genetic and performance information offered during the sale of bull varies by seller and scenario. Bulls sold private treaty, may have less data available than those sold through a sale. Sale catalogs are an excellent place to find this information. Performance data may or may not be presented, but is usually shown as adjusted weaning or yearling weights, average daily gains, or weight ratios. If you have done business with the breeder before and know the consistency and quality of his program, performance information is extremely valuable in sorting through a bull offering. The deal-breaker here is genetic information, potential herd sires need to have genetic information at least in the form of EPDs. The exception here is obviously commercial bulls that are not registerable through a breed association, but in the case of registered bulls, genetic information should be provided. In my visits to operations around the state I am often directed toward a bull and told that he is a purebred, but wasn’t registered. The value of a registered bull is in having access to pedigree information and genetic predictors, so if you are not going to see these benefits, don’t pay registered prices for unregistered cattle. The focus of this article is not how to use EPDs, that’s a conversation for another day, but the point I’m trying to make is that whether you make your living with cattle or work a full-time job and just have 20 head on the old home place, the ability to select bulls based on genetic merit will positively impact your bottom line as long as the cattle are managed properly. At a bare minimum the information in the previous section should be available on any bull you consider for purchase. Some progressive producers may choose to collect more information on their bulls, or manage the cattle in such a way that their value is increased and a higher sale price may be justified. Refunding the purchase price to the buyer and reclaiming ownership of the bull in question. Replacing the problem-bull with another of equal value. Refunding the difference between purchase and salvage price after the buyer has sold the bull for beef. Giving a credit toward the future purchase of another bull. As expected, most of the time, a better guarantee comes at a higher cost because the seller is absorbing more risk if there is a problem with the bull. The gamble with using EPDs as a fail-safe selection tool is the accuracy of the prediction in young cattle that have few, if any, progeny. The lack of confidence associated with EPDs on young bulls comes from not having progeny and sometimes performance data both of which increase the accuracy of the EPD. In young bulls, for example, most of their genetic value is based on their pedigree. As these animals age and have offspring, we know more and more about their genetic merit. This increased confidence is denoted by an increase in the accuracy value (0 – 1 scale) associated with each EPD. It does not necessarily mean the EPD increases if accuracy increases. It just means the EPD becomes closer to the true value, whether it increases or decreases. Remember that EPD stands for EXPECTED progeny difference. Genotyping a young animal increases accuracy because having knowledge of the genetic makeup has a similar value to adding the performance of 5 to 50 progeny, depending on the trait in question. Samples of DNA can be collected very early in life, and unlike metabolites or hormones, the genetic code does not change over the course of an animal’s life. Genomic testing allows producers to take a virtual snapshot of a portion of the genes that are flowing in the population which regulate economically important traits. 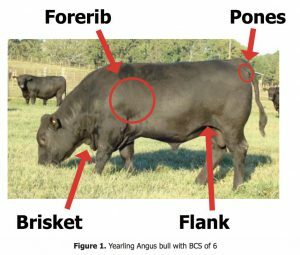 This increased knowledge about the actual DNA of an animal allows for increased confidence in the genetically enhanced EPD (GE-EPD), and has real value for the buyer of the bull. Arguably, the best way to for a seller to add-value to his bulls, is by doing business the right way. Cattlemen who have established a reputation for producing quality herd sires, and havie a good relationship with their customers set themselves a cut above the rest, and often have the ability to demand a premium for their cattle. There are buyers who will choose not to pay for a bull from a reputable program, but repeat customers of dependable breeders will usually tell you that the sale price was justified by the added peace of mind knowing the seller will stand behind the cattle, and that buying from a program with a history of producing quality cattle is worth the extra investment. It’s the same concept we face when purchasing household items. Do I buy the name brand toilet paper, or take a chance on the cheap stuff? For more information of purchasing bulls contact your local UGA Extension Office by dialing 1(800) ASK UGA-1.